Bentley was given to me several years ago, he'd been to several homes but didn't fit in. Everyone said he had issues, he's been the best little man that entered our home. He fit right in from the first minute, my husband and I love him as much as he loves us. Just a ball of white loving fur that gives lots of kisses! 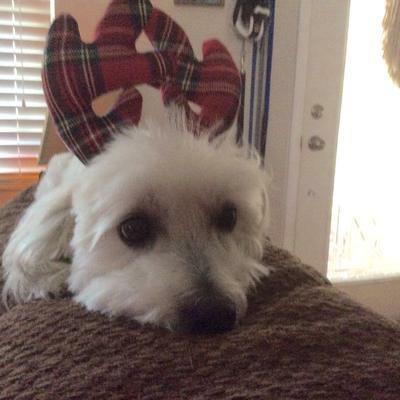 Comments for Bentley my reindeer! when my husband and I went to pick out our Coton the breeder told us she believed the dogs picked their humans. Apparently Bentley finally found his perfect fit in you! I am thrilled for you and hope you enjoy a long, happy life full of sweet Coton kisses! Have a blessed Christmas! What a boy! You are so adorable boy. We are so glad to hear you and your parents found each other. Merry Chrstmas and a happy new year! How wonderful you found Bentley and he has a loving home and brought joy to your home. He looks adorable and we wish you and him a very Happy Christmas and healthy new year. Sounds like things worked out exactly as they were supposed to. So glad Bentley finally got the good home he deserved. Join in and write your own page! It's easy to do. How? Simply click here to return to Coton de Tulear Pictures.